New Year’s Day 1901. 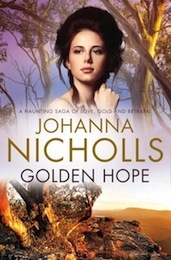 Golden Hope tells the story of Clytie Hart, a daring equestrienne, who is travelling with her mother in the Wildebrand Circus. A chance meeting with young adventurer Rom Delaney, and his invitation to play in Hoffnung, an isolated gold-mining town, promises to restore the circus’s failing fortunes. Clytie has only ever known the roving life but much as she loves her circus family, she longs to live in a real house in a friendly bush town, and to free her mother from her violent stepfather. In the face of unexpected tragedy, and with the help of unlikely friendships, Clytie uncovers some stark truths. Hoffnung’s respectable veneer conceals the secrets of a town haunted by a mystery that threatens to blight Clytie’s life – and all those she has learned to love.